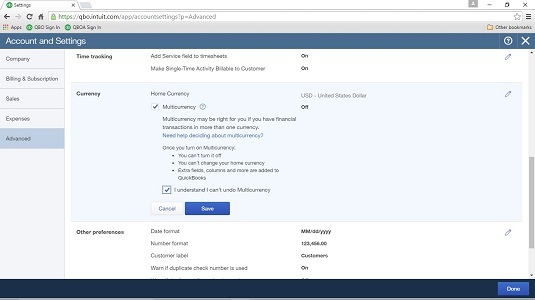 The Plus version of QuickBooks Online supports using multiple currencies. Typically, you use the Multicurrency feature when you sell products and services to customers or buy products and services from vendors whose base currency is different from your home currency. If you don’t need to record transactions in multiple currencies, don’t turn on this feature because you can’t turn it off again. Also be aware that the multicurrency feature in QBO doesn’t support customer- or currency-specific pricing. If you need either of those features, you need to use QuickBooks desktop. 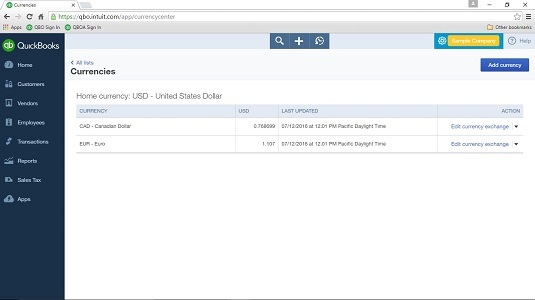 Because you can assign only one currency to each account, customer, or vendor, you need to add new asset and liability accounts, customers, and vendors for each different currency that you will use in transactions; as you create these new elements in QBO, you assign to them the currency you want to use. Be aware that, once you’ve posted a transaction to an account, a vendor, or a customer, you cannot change the currency of the account, vendor, or customer. Income and expense accounts continue to use your home currency — the currency of the country where your business is physically located. Turn on the Multicurrency feature. Set up the currencies you intend to use. Add customers, vendors, and necessary asset and liability accounts for each currency you expect to use. Note that QBO automatically creates Accounts Receivable and Accounts Payable accounts in the foreign currency after you create one foreign sales and one foreign purchasing transaction, so you don’t need to set up those accounts. When you open the Gear menu, you’ll see the Currencies option at the bottom of the Lists column. You use the Currencies list to establish the foreign currency you want to use, along with the exchange rate. When you view the Chart of Accounts, you’ll find a Currency column that shows the currency assigned to each account. You’ll also find a new account — an Other Expense account called Exchange Gain or Loss. When you view Bank and Credit Card registers, the currency of each transaction appears in brackets in the Payment, Deposit, Sales Tax, and Balance Due columns. Sales and purchase forms use both your home currency and the foreign currency; QBO does all the conversions for you on the screen. On QuickBooks reports, you find that QBO converts all foreign currency amounts to home currency amounts, automatically reflecting exchange rate changes. Once you turn on the Multicurrency feature, you cannot change your home currency. Click Gear → Account and Settings. QBO displays the Account and Settings dialog box. Scroll down to the Currency section. Set your home currency by clicking the Home Currency list box. Choose the currency of your country. If you’re not in the United States, don’t set the United States as your home currency. You can’t change your home currency. Select I Understand I Can’t Undo Multicurrency. You can’t turn off the Multicurrency feature because it affects many accounts and balances in QBO. QBO displays the Currencies page. In the upper right corner of the page, click Add Currency. QBO displays a drop-down list. Select a currency you want to use. QBO redisplays the Currencies page with the new currency added. QBO always records exchange rates, shown on the Currencies page, as the number of home currency units needed to equal one foreign currency unit. QBO downloads exchange rates every four hours from Wall Street On Demand, but you can, if you want, provide your own exchange rate. Click the Edit Currency Exchange link beside the rate you want to edit and supply the rate you want to use.